The Russian Defense Ministry takes a calculated stand against cyberwarfare. The Russian Defense Ministry has posted on its website a document entitled “Conceptual Views on the Activity of the Armed Forces of the Russian Federation in Information Space.” Almost at the same time, Deputy Prime Minister Dmitry Rogozin said that Russia might create a “cyber command”, which would be tasked with enhancing information security. The Russian war machine has prioritized timely information gathering and processing, as well as information interference and countermeasures, since the beginning of the 20th century. Data transmission and processing facilities have come and gone but the underlying principles remain the same: constant gathering of information about the enemy, active measures to counter reciprocal activities by the enemy, and a broad, multilayer deception system. Back in the Soviet era, information and psychological pressure on friendly and enemy troops was high on the agenda. Now that the Internet has tied the world into an integral whole and data accessibility has improved along with the possibility of handling information flows, the importance of working with information has grown dramatically. The global information space has become an independent theatre of operations, in which successes and failures can have a serious impact on developments in the real world. The collapse of the Soviet Union and the events that ensued, which took place simultaneously with the rapid development of information technologies, did nothing to contribute to development of the army, which at that time fell behind potential enemies in many areas, including in information warfare. In the meantime, “potential enemies” were busy creating special services to conduct operations in cyberspace with the broadest scope of duties – from an active search for essential information about the enemy to propaganda warfare, interception of control and physical destruction of the most important equipment with the help of modern computing technologies and software, including viruses. 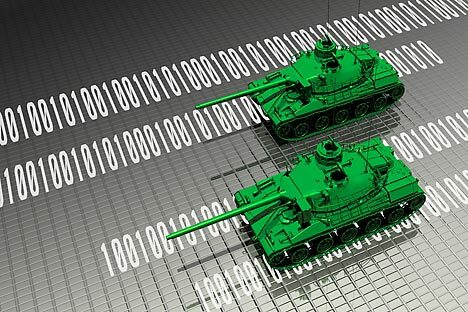 The concept published by the ministry is the first official guideline document of this kind in the Russian armed forces that might provide a basis for a full-scale cyberwar strategy. So far, the concept has no offensive action provisions and focuses entirely on deterrence of the enemy, prevention and resolution of conflicts. At the same time, the concept spells out some long-range provisions. First of all, the document recognizes conflicts in information space with the use of information weapons as military conflicts. Information warfare is thus treated as conventional warfare, in which Russia reserves the right to use any means deemed necessary for retaliating against the aggressor. This provision is crucial, because a cyberwar defeat might cause an entire military campaign to fail or pose a real threat to the security of the state in real life. Recognition of cyberwar as a form of military operations allows initiators, coordinators and participants in these operations to be treated as combatants, with all the associated consequences. Importantly, the concept envisages concerted actions with Russia’s allies that have become targets for information attacks. This is a natural move – to leave allies unshielded in such a war could lead to loss of allies faster than in a conventional war. The new Defense Ministry document will likely be upgraded into a full-scale code identifying the activities of the Russian armed forces in times of cyberwar. From the point of view of national security, the need for such a code is obvious, as is the need for a special command to conduct operations in cyberspace. The only question that remains is how soon this self-evident idea might be implemented in Russian defense doctrine and military practice.